Since 1993, Drs. Tappero and Honeyfield’s book has served as an invaluable resource for nurses, as well as for any health care worker involved in neonatal care. Springer Publishing, a leading publisher in nursing, social science and beyond, is now publishing the acclaimed title Physical Assessment of the Newborn. The title, from authors Ellen P. Tappero, DNP RN NNP-BC and Mary Ellen Honeyfield, DNP RN NNP-BC, is widely recognized as the premier resource for gestational, neurologic, and behavioral assessment of the newborn. The fifth edition is available now from Springer Publishing, with the sixth edition currently slated for 2018. 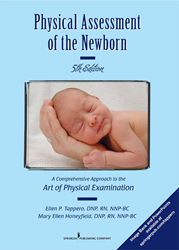 Physical Assessment of the Newborn (PAN for short), now in its 5th edition, is a valuable addition to Springer Publishing Company’s growing list in the increasingly prestigious field of advanced practice neonatal nursing, joining currently published titles including Comprehensive Neonatal Nursing Care, Neonatal Advanced Practice Nursing, and the Neonatal Nursing Care Handbook. This acquisition will provide Springer Publishing the opportunity to publish a key textbook in the neonatal nursing market, as Physical Assessment is a core, required course in all 37 of the MSN/Neonatal Nursing courses currently existing around the country. Springer Publishing’s plans for the title include creating a faculty resource package that will include PowerPoint slides and an image bank for use by faculty to customize online and in-class learning modules. These initiatives currently are being developed.